Today we will continue to practice solving problems with Pythagorean Theorem. Complete "The Pythagorean Theorem and Its Converse Color by Number." Use Pythagorean Theorem to Find Right Triangle Side Lengths. Use Pythagorean Theorem to Find Isosceles Triangle Side Lengths. Use Area of Squares to Visualize Pythagorean Theorem. Your score will be an average of the four assignments. Make sure your 7-3 notes are complete. Today we will look into how we can use the Converse of the Pythagorean Theorem to identify right triangles. Objective: I can use Pythagorean Theorem to solve problems. Essential Question: What type of problems can be using the Pythagorean Theorem? Take notes on the examples from 7-3. Today we will do a quick check on angles, parallel lines, and triangles. Have your computer, a sheet of paper, a pencil, and a calculator ready to go. Complete the assigned assessment in Pearson. Assessment must be complete during the class period unless you have accommodations via 504 or IEP. Early finishers: Make sure your 7-2 notes are ready to go. Work on your FSA Specs packet. Finish any incomplete work you may have. Complete pages 10 - 13 (11 questions) in your FSA Specs packet. Pay attention to the "calculator" requirements when completing. We will review tomorrow. Today we will kick start Topic 7 on Pythagorean Theorem by looking into how to use the proof to find the unknown length of a right triangle. Add "The Pythagorean Theorem" foldable into your notebook. Objective: I can use the Converse of the Pythagorean Theorem to Identify right triangles. Essential Question: How can you determine whether a triangle is a right triangle? Take notes on the 7-2 examples. Today we will kick start topic 7 on Pythagorean Theorem by reviewing past skills and building our vocabulary that will be useful for the topic. Review items for the quiz on angles and triangles. This is to provide me information on what I need to do to help prepare you for Pythagorean Theorem. Objective: I can use Pythagorean Theorem to find known sides of triangles. Essential Question: How does the Pythagorean Theorem relate the side lengths of a right triangle? Today we will finish up Topic 6 by using angle measures to determine whether two triangles are similar. Add "AA (Angle-Angle) Similarity Postulate foldable to your notes. Practice: 6-10 MathXL Practice and Problem Solving. **Quiz on the second half of Topic 6 will be Tuesday, 4/16 or Wednesday, 4/17. 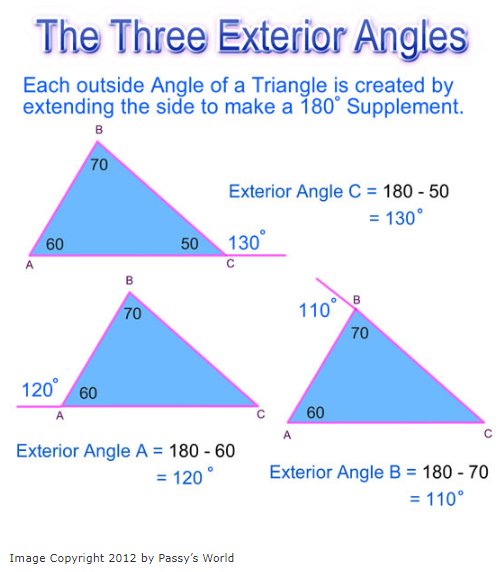 Today we will continue our practice with triangle sum and exterior angles. Today we will continue to work on how to identify the relationships between angles formed by parallel lines and a traversal. We will use the relationships to help find the missing value or angle measurements. You should be able to complete half in class today. Finish the rest of your task cards. 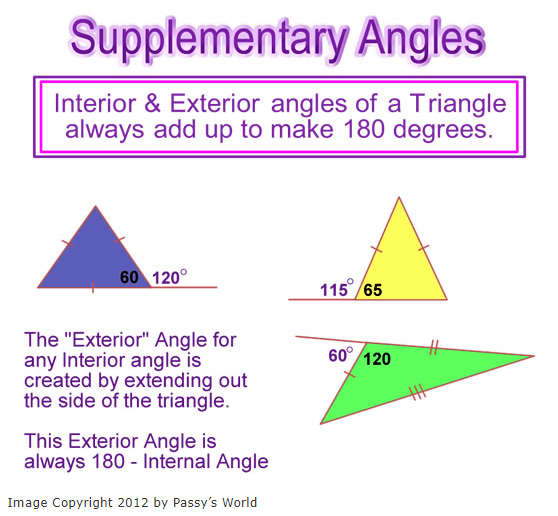 Today we are going to work on how to determine unknown measures of interior and exterior angles of triangles. 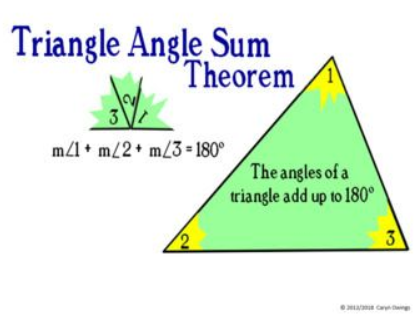 Add "Angle Theorems for Triangles" foldable to notesbooks. Objective: I can use angle measures to determine whether two triangles are similar. Essential Question: How can you use angle measures to determine whether two triangles are similar? Take notes on the 6-10 examples. 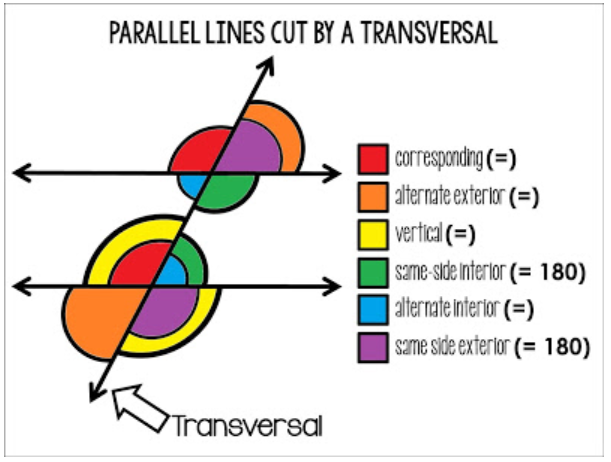 Today we will identify the relationships between angles formed by parallel lines and a transversal. We will also be able to determine the measures of angles formed by the parallel lines and transversal line. Objective: I can determine the unknown measures of interior and exterior angles of triangles. I can write and solve algebraic equations to find angle measures. 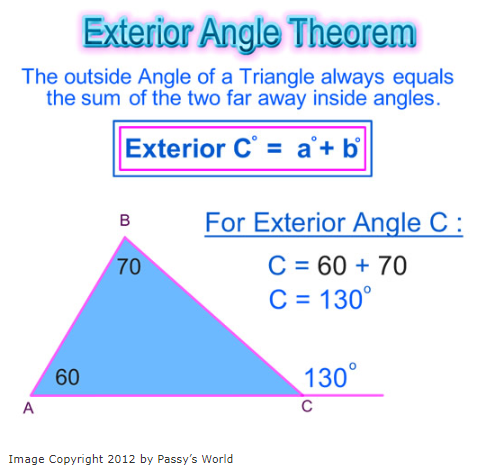 Essential Question: How are the interior and exterior angles of a triangle related.